Hailing this taxi might just yield the strangest trip anyone has taken for a while. Canadian author Rawi Hage’s new novel as told by Fly, an immigrate taxi driver in an unnamed city, will arrive in the U.S. this summer. Released in Canada in the fall of 2012, this gritty, rather non-cohesive novel is set up in five acts. 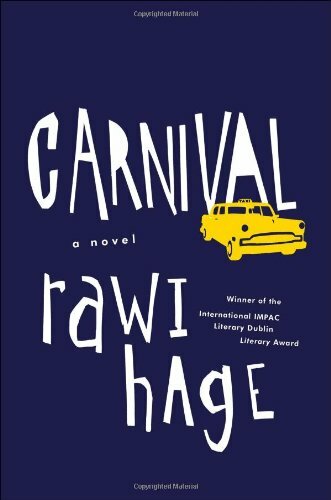 Reminiscent of a Greek tragedy, but lacking the true dramatic structure of Freytag's pyramid, Carnival is a sad, callous commentary on modern civilization. The callousness is softened only by Fly’s occasional and unexpected acts of kindness. Translation: Fly grew up in a circus guessing people’s age and weight after his carpet flying father left them to pursue his religious aspirations and his trapeze flying mother hung herself. Yup, Fly’s masturbating—which he does a lot. Mr. Hage’s writing tiptoes on the edge of relevant political commentary and grotesque ridiculousness. Weaving together a loose tale told in poignant and entertaining vignettes of the daily life of a taxi driver, Fly entertains himself with both words and debaucheries. He introduces a carnival of prostitutes, drug dealers, strippers, disturbed revolutionaries, wealthy sexual deviants, lonely women, and bearded ladies. This novel would be close to brilliant if Mr. Hage left it at that. But midway through the novel, as if suddenly realizing he had no plot, the author has the novel take an abrupt Greek tragedy-esque turn. A slew of senseless murders and disappearance of characters leave Fly, and those hailing this taxi, disappointed and flying aimlessly alone. Read this novel not to be entertained by the story, but to be awed by the beauty of the words.